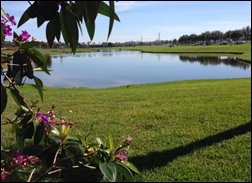 Orlando weather is perfect, with lots of 80-degree sunshine and comfortably cool mornings at around 60. 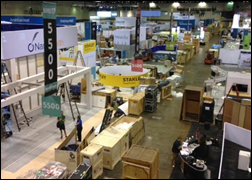 I took a long walk today around the North, South, and West parts of the convention center. HIMSS is in the oldest (West) part on the other side of International Drive from the others, opposite the Hyatt (formerly known as the Peabody, where the first HIStalkapalooza was held in 2008). 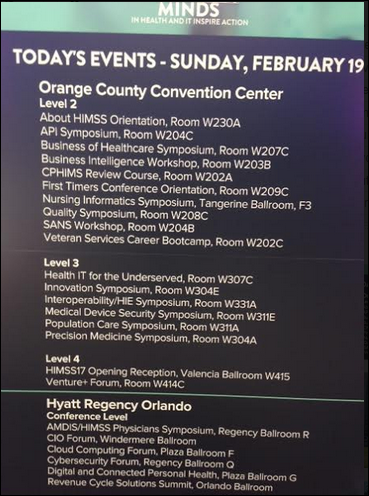 Every HIMSS conference that I’ve attended in Orlando was on the West side except one, which I seem to remember moved across the street for just that one time right after the new part opened. The convention center was close to empty today, with just a few casually dressed boothers eating lunch in the vast open spaces they shared with setup people and equipment operators, the harmony of which for some reason made me happy. 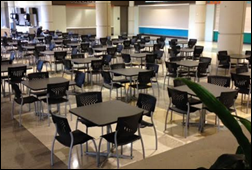 You must arrive to the HIMSS conference days early if you want to spot this rare phenomenon – empty chairs and tables. These will soon be coveted by well-dressed IT nerds desperate to sit to gulp down their high-cost, low-quality, precariously-balanced salads or sandwiches, but who find themselves blocked by non-eaters camped out with their laptops, phones, and papers. I was speculating on this and arrived at the conclusion that conferences don’t want you sitting comfortably since that doesn’t pay the bills like forced marches through the exhibit hall. Here’s what’s happening Sunday. The opening reception is right in the convention center this time instead of across the street at the Hyatt, which is nice because people were always getting lost trying to find it. 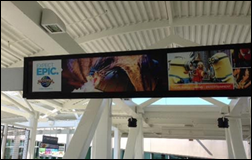 I don’t think the fire-breathing “Epic” on this convention center sign refers to the red-lettered one, but you never know given its penchant for whimsicality. 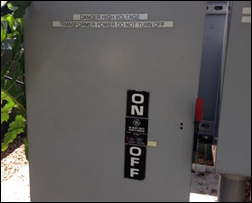 Perhaps it’s a testament to the inherent good-naturedness of humans that this unsecured but apparently important switch is placed right on the I-Drive sidewalk in front of the convention center. I pictured flipping it and watching the entire facility go dark. 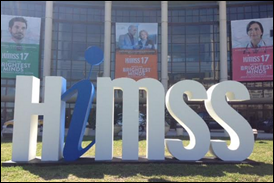 Getting passers-by into your HIMSS booth requires having friendly, alert booth reps, according to the nearly half of poll respondents who said it’s the most important factor. You will see endless examples next week where companies have invested heavily in the low-percentage items, but failed to pay adequate attention to this most important one. 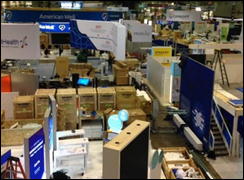 I always wonder what’s going on when I see an empty exhibit hall booth where a company didn’t show up. Did they change their mind, go out of business, get stuck somewhere snowy, or run out of money to send employees? Maybe I’ll keep a list and follow up afterward. New poll to your right or here: what do you think the VA will do with regard to its EHR? Welcome new HIStalk Platinum Sponsor Ilum Health Solutions. The company, just launched by drug maker Merck, helps hospital improve infectious disease outcomes and antimicrobial stewardship via technology that helps clinicians stay connected to real-time health system patient data. It offers clinical decision support to maintain treatment pathway adherence, a Command Center Dashboard for case browsing and prioritization, and automatic creation of CLSI-standard antibiograms. It reports key measures from cases to cohorts, giving hospital leaders the ability to track performance such as patient outcomes, clinical pathway adherence, prescriber-level resource utilization, clinical outcomes from stewardship programs, rates of disease, antibiotic use trends, and automated NHSN AUR reporting. Hospitals benefit from reduced inappropriate antibiotic use and and variability in care that can lead to sepsis. 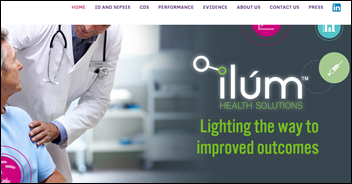 Thanks to Ilum Health Solutions for supporting HIStalk. The Wall Street Journal says Theranos was down to $200 million in cash at the end of 2016, having burned through $700 million of investor money. The company had no revenue in 2015 or 2016, has no funds set aside for any lawsuit liability (at least $240 million in suits have been filed against it), and has yet to earn FDA approval to sell its only remaining product, the MiniLab testing machine. Imagine valuing a company with zero revenue at $9 billion before its bubble burst. 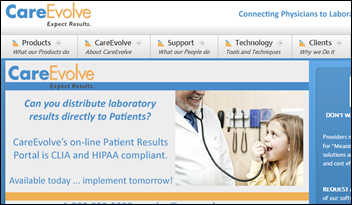 Connectivity vendor Ellkay acquires the assets of CareEvolve, which include its lab outreach portal and connectivity. I will assume that Party on the Moon meant “can’t wait” in their Facebook update and are actually happy to see us all again. They’re going to be amazing. 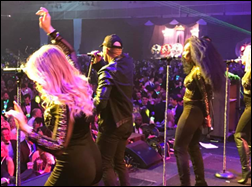 You are TOO KIND to Theranos…. I suspect the world is waiting for the movie to actually speak up. Im shocked that, beyond WSJ, folks are quite kind. They are like the Tylenol Scare of the ’80s! Too Bad Phil Corbey is no longer with us, but Arizona and others should consult his son, Phil Corboy, JR. to represent them.